At the April 26, 2016 meeting of the Sport Fisheries Advisory Commission, the Commission recommended the creation of a Black Bass Advisory Subcommittee. 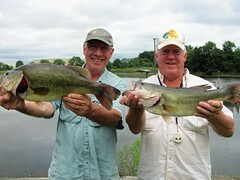 Since the early 1990’s the Department has hosted informal meetings, as needed, called the Black Bass Roundtable to discuss black bass management. Based on the black bass population status in the upper bay and Potomac River, further management actions are necessary to hasten the recovery of this fishery and the Black Bass Advisory Subcommittee will make recommendations regarding these actions and Statewide management. The Black Bass Advisory Subcommittee will be an organized subcommittee operating under the auspices of adopted guidelines with an appointed membership of Tournament Directors, Fishing Guides, conservationists, and bass anglers. The Subcommittee will make recommendations on black bass management to the Sport Fisheries Advisory Commission. The department will provide staff support. The Black Bass Advisory Subcommittee will receive agendas, meet, discuss agenda topics, and develop recommendations that are reported directly to Sport Fisheries Advisory Commission. The Commission will report directly to the Secretary, when appropriate. The meetings will be open to the general public. Meeting minutes will be drafted following meetings and serve as communication to the general public that cannot attend. Black Bass Advisory Subcommittee members serve 4 years, with possible reappointment, and may continue to serve until a successor is appointed. Applications will be considered by the Director of Fishing and Boating Services. The Director will provide recommendations to the Sport Fisheries Advisory Commission. Black Bass Advisory Subcommittee members will be appointed by Sport Fisheries Advisory Commission. There are currently 12 members. Click here for a list of members. The Department of Natural Resources is not accepting applications at this time.